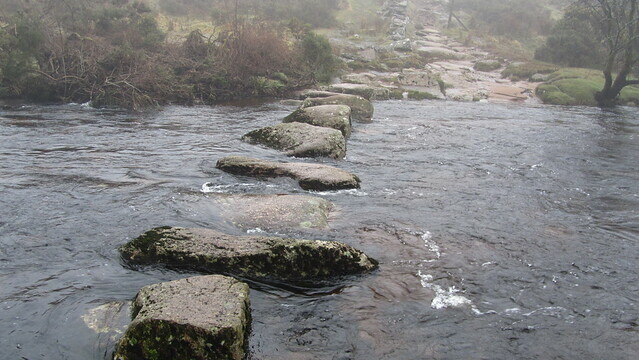 Moorland Walker: Dartmoor: Bellever Forest and a stepping stone too far. Dartmoor: Bellever Forest and a stepping stone too far. The drive down the A386 from Okehampton to Tavistock was bathed in sunshine, and had me enthused about the prospects of the walk today. Where was this fog the Met office had predicted? Sure enough, as I turned left and climbed onto the moor, I hit the clouds! I passed numerous coaches and mini buses off loading their teenage cargo; heavily laden kids sent out into the murk as part of their ten tors training, whilst their teachers sauntered off for a leisurely bite and a brew at the Fox Tor Cafe, in Princetown. When I arrived about 10am, there were plenty who had beaten me to the best of the tables. I checked into the bunkhouse after breakfast, then carefully drove through the fog to Postbridge. 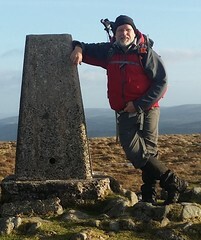 With conditions as they were, I didn't think it wise to wander too far onto the open moor alone, and chose a route south to Bellever Tor, and Dunnabridge Pound, with a long term plan of creating a circular route encompassing part of the Two Moors Way near Babeny. I took the right path! I had some archaeology to find early on; a couple of cists situated just off the path. In such poor visibility, I was having to continually check my bearings; in good weather this route is a wide muddy track I suspect would be easily visible from space, but today, there were occasions you just couldn't be sure you were still on it. Ascension was a good sign I was heading in the right direction and eventually, out of the gloom, a dark shadowy monster appeared, the silhouette of a trig point riding high upon its back; I had reached Bellever Tor. The view from its peak is inspiring, but today it was the stuff of both my memory and imagination. Onwards, south. I eventually reached an expected wall, one which I would hand rail to Dunnabridge Farm, and the Pound. The wall was a comforting companion, and I diligently ticked off each intersection and gate; when the weather is this crap you have to make up your own games to amuse yourself. At the pound, I picked up the track to Laughter Hole Farm; this time reverting to a spot of timing for the next mile or so, when I would reach the forest again. Into the forest down a wide track to an intersection, where I almost doubled back on a smaller rockier, and darker, path, that was to take me down to the East Dart River. This was where my route was a gamble, and further progress depended upon it; The south-west region had just had a monumental dumping of rain over the previous two days, and I wasn't certain the Laughter Hole stepping stones were submerged or not. When I reached them, I was pleased to see they were just above the water line. I gingerly began my crossing; one, two, three... by the time I reached number seven, my bottle went! A combination of the rushing water around me, and a summation of the object of my next footfall, had me hesitating. I could reach it, but it looked an awkward pointy nemesis, and not one to dwell on. I couldn't guarantee I would have enough momentum to make the next leap forward, especially now I had faltered. I have done this crossing before, when the river was lower, and less intimidating, and with companions. With the assurance of a buddy to fish me out, I no doubt would have made that leap, but here I was, alone, in a pea souper, having not seen a soul for a few hours... no, it wasn't the sensible choice to make. Three quarter of the way across the river, I retreated in the knowledge I was making the right decision. Had this been my only route, I would have simply removed my boots, socks, trousers and waded over, but this was simply a short amble on a Saturday afternoon, so really not necessary. So I filled up my water bottle with some of the finest filtered East Dart, and then retraced my steps back to the main track. The way eventually descends to the beautiful banks of the river. I've often toyed with a wild camp on the opposite side, which appears to be a legal spot to do so; one for the future. I stopped at Bellever Clapper Bridge to eat my lunch. I've passed this way before and can remember an idyllic scene of children paddling on a hot summers day while mothers attended to picnics laid out on the grass. Today, I didn't linger long, as my hands were beginning to feel the cold as I held my sandwich, and it really was quite miserable now. The fog had worsened, and my thoughts were turned to a cup of coffee back at the cafe. 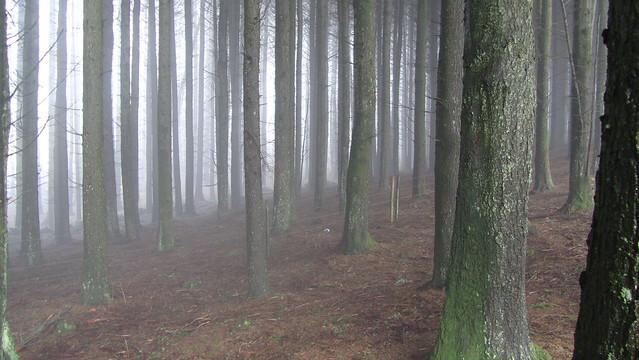 I followed a bridleway to the road that leads into Postbridge, alongside the dark forbidding Bellever Forest. As I neared the main road, I met my first walkers of the day; predictably, a bunch of these strange teenagers, with an enthusiasm and willingness to embrace the elements; a rare quality not possessed by the couch potato species being bred in the likes of London. Our meeting was brief, following me across the road and taking my steps through a boggy bridleway, but as I turned into the car park, they set off to the bleak north; rather them than me!